The attention of all the District Educational Officers in the state is invited to the reference cited, wherein the Director, Andhra Pradesh National Green Corps, Environment, Forest Science & Technology Department has informed that the Ministry of Environment, Forest and Climate Change, EE Division, Government of India, New Delhi has released Financial assistance for strengthening of the implementation and monitoring of APNGC Eco Clubs at District Level in all the 13 districts of Andhra Pradesh. 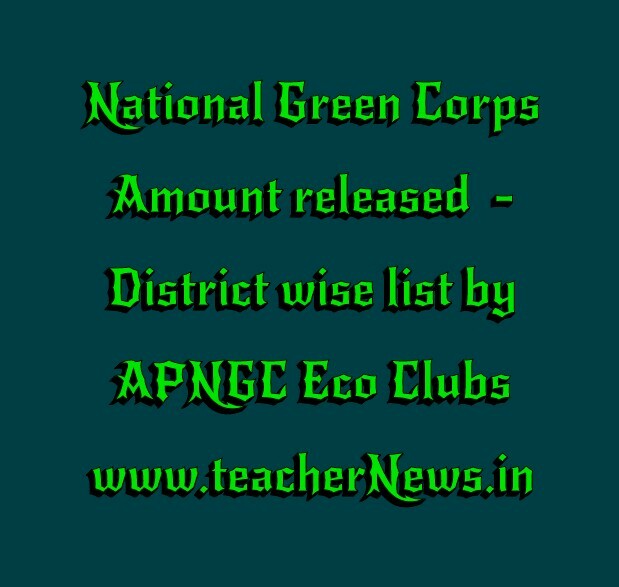 Further the Director, APNGC has released an amount of Rs.3,25,000 (Rs.3,25,000 Three lakhs and twenty five thousands only) and requested the S.C.E.R.T., to release the same to the (14) district coordinators and 130 Green School Teachers for monitoring the NGC activities organized through Eco-clubs for strengthening the implementation and monitoring of Eco Clubs at District Level 2018-19 duly enclosing district wise schools list obtained from District Coordinators for transfer of funds to implement the scheme and also requested to issue necessary instructions to all the DEOs in the state to monitor the NGC activities in all the Eco-Clubs. Accordingly the Director, S.C.E.R.T., is pleased to sanction an amount of Rs.3,25,000/- (Rupees Three lakhs and twenty five thousands only) to the Districts. 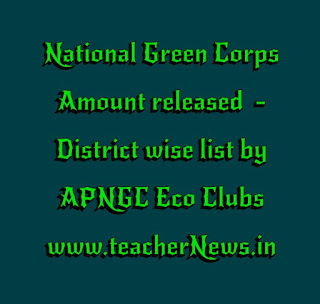 AP National Green Corps Amount released - District wise list by APNGC Eco Clubs.APNGC Eco Clubs monitoring funds released list .